The role of the caretaker is never easy in taking care of a loved one. For 2 years, my uncle lovingly took care of my auntie, who was reduced to a vegetative state as the result of stroke. He would visit her everyday to lovingly speak to her and take care of her- for 2 years, my auntie who could only move her eyes….never had a single bed sore. My auntie passed away after that and my uncle is left to a life by himself – but looking at him, I knew it was a choice that he had never regretted (to be with her despite numerous family objections from both side – but they had almost 30 happy years together). The measure of true love is no in the material gifts, fancy restaurants, fame, beauty and net worth. It is how one would still be with the other person in spite and despite of ups and downs, happiness and suffering, sickness and health. No matter how you changed or what you’ve become, I will always be by your side. 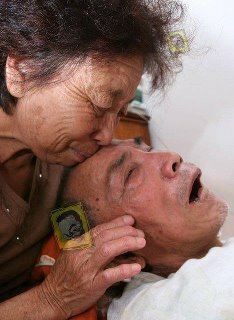 Mrs Liu has been looking after her paralyzed husband since the year 1983.
but Mrs Liu will look after her husband till the last second of her life. Source: Shared from 心靈甘露, a Facebook page.